LifeSystem can be used intuitively, regardless of their physical capabilities or mental capacity. Adaptable, extendable and flexibly usable products promote their users' independence and mobility without neglecting aesthetic design. Form and function are united in LifeSystem. 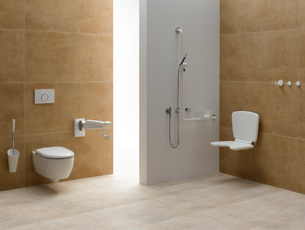 The sanitary system offers comfort, convenience and safety in equal measures. Function, flexibility, easy maintenance and robustness support the care personnel in their day-to-day work and therefore make LifeSystem the professional system for care. The system's modularity enables individual solutions. The products can therefore be flexibly adapted to the respective measurements of the user: For example, the height of the shower seat is adjustable and the projection of the hinged support rail can be changed. 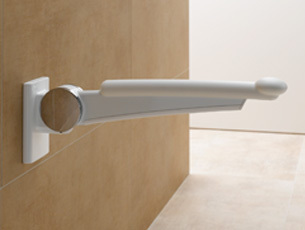 The upgradability enables flexible adjustment to the needs of the user – for example individually hinged armrests can be added to the shower seat. The products have been developed according to ergonomic and kinaesthetic aspects, in order to optimally promote the mobility and independence of the user. They help to compensate for physical limitations. Well thought through product details offer both convenient and safe use. Together, the products result in an intelligent system, which supports users and the care personnel.